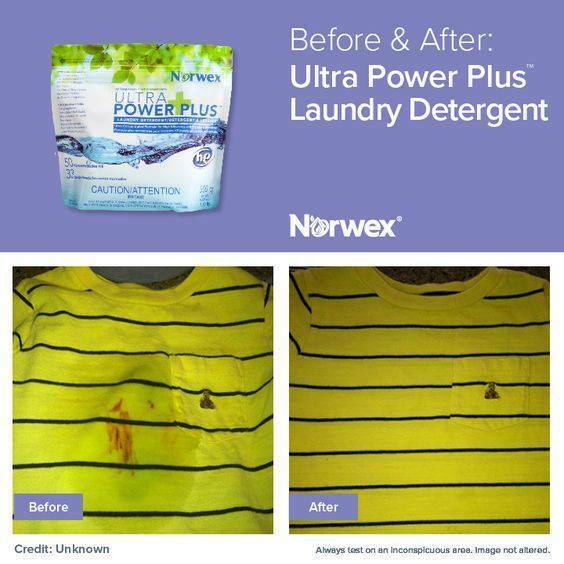 Norwex Ultra Power Plus is a highly concentrated, superior stain removing powder suitable for ALL types of fabrics. It is filler-free and unscented and will not leave any residue in your clothing. It has superior stain removing properties, whitens whites, brightens coloured fabrics, and cuts through grease and dirt leaving clothes soft and fluffy. A 1kg bag washes at least 45 large, heavily soiled loads or 90 normal loads in a top loader, or when used in a front loader or together with the magnet ball, it washes 180 to 360 normal loads! An additional benefit is that most fabrics will not build up static in the dryer as there are no fillers left in your clothing, reducing the need for dryer sheets or fabric softener. WHERE TO USE: For ALL types of fabrics – cotton, nylon, wools, linen, synthetic fabrics, and will get the best results on your microfibre! Ultra Power Plus is safe for washable colourfast fabrics. Some fabrics may be susceptible to colour change when laundered as directed. HOW TO USE: Dissolve detergent in wash water before adding clothes. Do not apply detergent directly on clothes. Rinse clothes well before drying. For washing and drying follow garment care label instructions. *For large or heavily-soiled normal loads use 1 – 1.25 tbsp. *For heavily-soiled large loads use 1-2 scoops (up to 2 tbps). *When using with the magnet ball OR in a front loader, halve these amounts. For a normal load in a front loader, 1-2 tsp (up to half a scoop) is usually enough. Most of my Canberra customers report 1 tsp is enough for a normal load in their front loaders. *When using in an High Efficiency (HE) washing machine, again, try 5 ml (1 tsp) per load dissolved in water. *Can be diluted in water (1 to 1.5 Tbsp per cup) to form an effective grease-cutting stain remover. For hand washing, rubber gloves are recommended. Keep in mind, these are the basic rules, however some customers have had success using less again, so feel free to experiment with amounts to work out what your machine, water type, and clothes need. In general, harder water areas need more detergent than average, softer water areas less. NOTE: I recommend that you “pre-wash” your machine with Ultra Power Plus (UPP) before using it for a load of washing. This involves washing an old towel or something similar in a very hot wash with a cup full of vinegar and a scoop of the UPP (and the magnet ball if you have it). The towel will pick up all the gunk pulled from the machine. Sometimes you may have to do a couple of washes (particularly with front loaders as you can’t use the magnet ball in them) but it will all be worth it because the UPP and magnet ball will keep your clothes AND you washing machine cleaner! WHY do a machine cleaning wash first? Some customers have reported that when they start using these products, their clothes are coming out dirty, particularly whites. This can happen because the UPP and magnet ball are pulling all the gunk out of the drum and pipes of the washing machine and the gunk ends up in your clothes!